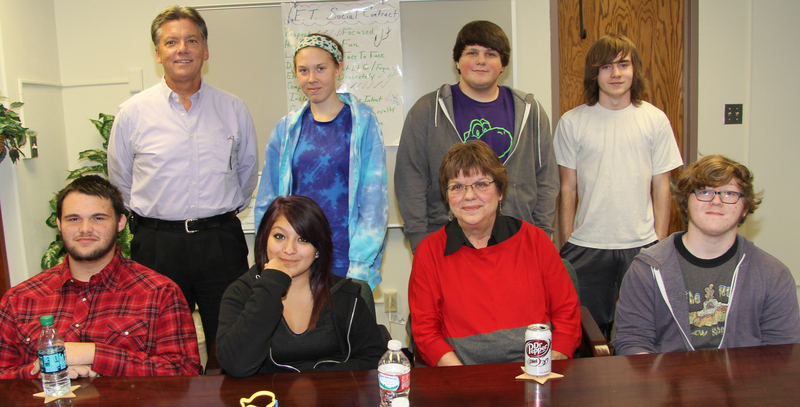 The Fall 2014 Haysville High School Leadership Class recently visited the Haysville Public Schools Administration Office to meet with Superintendent Dr. John Burke to learn about the operation of the school district. The program is a joint activity with the City of Haysville and Haysville High School. The students learn the characteristics of being a good leader, assist with a variety of functions within their school, meet with leaders of the community and school district and collaborate on the PowerPoint shown during graduation exercises in May. HHS Leadership students meeting with Dr. Burke were: (Front row) Spencer Cook, Alyssa Zavala, Marcia Craft (HHS Teacher) and Nick Havel. (Back row) Dr. Burke, Sarah Boes, Ryan Womack and Dylan King.